We offer state, national, and international pageants. At our National levels, we offer our National Sweetheart Pageants and National Queen pageants. The Sweetheart program was originally created for Director's family & friends to compete in. In 2013 the demand for contestants who didn't have state titles grew so much that we decided to add contestants who want to compete as an at-large contestant to our Sweetheart program. It's a great way for our contestants to get experience pageantry on a national level and to help them dream big and encourage them to come back and compete for a National Queen title the following year. Our National Queen Pageant is for State titleholders in the USA or for countries whose winners are able to travel and compete at the International Pageant. Ladies of all ages, 0-50+ and boys ages 0-14, Infant, Baby, Toddler and Tot Kings and Queens, Little, Pre-teen, Young and Teen Miss, Miss, Ms., Elegant and Classy Miss. Inspire others, be a leader in whatever you do, and strive to achieve your dreams and goals! At Pure International Pageants every contestant can be themselves. We want everyone to make new friends and memories to last a lifetime! Our friendly and courteous staff will be with you every step of the way--from the preliminary pageant through the national competition. Our goal is to make a positive difference in the lives of everyone we touch. We encourage good sportsmanship and emphasize good interview and public speaking skills while helping the contestant to learn more about his/her own style and fashion. We have age divisions for girls and women of all ages as well as boys up to age 14. 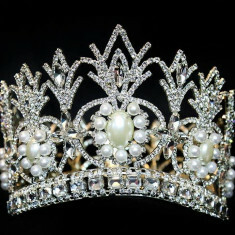 PURE holds both live state pageants as well as offering State Appointed titles for states that do not have a live event. PURE is just 5 years old (On February 28, 2016) and we hope to continue growing! We look for contestants who are passionate about community service, has a positive personality, and it very out going and welcoming.